The beauty of personal finance blogs is that there’s something out there for everyone. While MapleMoney’s mission is to help all Canadians with various money issues, many other blogs are geared towards a specific topic, like investing, or women’s finances. 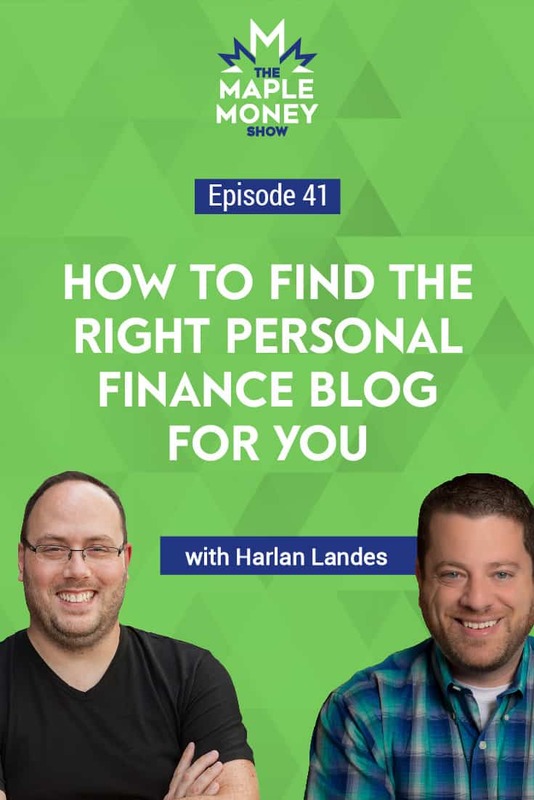 My guest this week is Harlan Landes, a long time personal finance blogger, and supporter of the money community through the Plutus Awards and Plutus Foundation. We begin our conversation with a history lesson of sorts, as Harlan takes us down memory lane, to the early days of personal finance blogging, back when AOL was king. We then fast forward to the present and discuss the modern media landscape. Harlan believes that one of the biggest difficulties today is understanding how to evaluate the information that’s coming to you. A lack of media literacy is making society very susceptible to propaganda, and advertising. That’s why it’s more important than ever to take a critical approach to information that is designed to sway you, to play on your emotions. Last, but not least, Harlan shares some great ways to find blogs and bloggers that resonate with where you’re at on your money journey, one of those being his very own Plutus Awards. Have you heard the saying, ‘what gets measured gets managed’? Our sponsor this week, Borrowell, conducted a recent study that found a correlation between the frequency of checking your credit score, and credit score increases. Head over to Borrowell to get your FREE credit score and report today! What is the motivation behind the content you’re consuming? You listen to the Maple Money Show, and I hope you also love the Maple Money blog but the beauty of personal finance blogs is that there’s something out there for everyone. While Maple Money’s mission is to help all Canadians with various money issues, they are great sites dedicated only to investing or women’s finances. Or maybe they write with a humor that attracts someone that might not have been interested otherwise. Harlan Landes is possibly the first personal finance blogger and money community supporter through the Plutus Awards and Plutus Foundation. He joins us to inspire you to find blogs and bloggers that resonate with where you’re at in your personal finance journey. We’ll also discuss how to read online content with a critical eye including whether or not they know what they’re talking about and what bias or profit motivation a writer might have. Welcome to The Maple Money Show, the podcast that helps Canadians improve their personal finances to create lasting financial freedom. This episode was made possible by our sponsors at Borrowell. Have you heard the saying, “What gets measured, gets managed?” Borrowell conducted a study that found a correlation between the frequency of checking your credit score and credit score increases. To begin increasing your credit score head over to maplemoney.com/borrowell. Now let’s chat with the man previously known as Flexo and Luke and now, Harlan. Tom: Hi Harlan, welcome to The Maple Money Show. Harlan: Hey, Tom. Thanks for having me. Tom: I wanted to have you on to discuss what people can look for in a blog. You’ve always been very community focused within the personal finance niche. Can you take us back to the beginning of your internet history and how built up these communities over time? Harlan: Well, we’re going back in time quite a bit here. I started as a middle school kid building communities online. This was before the web. Friends would install modems in their computers. And I would tell them when you get a new computer make sure you get a modem. It would allow them to use their phone line to dial up to other computers. So, we were building these communities online before there was the web. I ended up getting access to the Internet before it was available to a lot of people because my mother worked for a university and she let me play around with the university dial-in system which provided things like newsgroups. The Usenet Newsgroups were ways for people to talk to each other across the world where they could ask professional research related questions. At the time, the only people at the time people who were on the Internet—again, this is before the web, were people like university professors, researchers, scientists and the military. So a 12-year-old could ask a question like, “Is time travel possible?” and get a serious answer debating the physics of time and everything that goes into that, from a physics professor across the world. It was amazing. Then AOL came and gave access to everybody who paid their $10 monthly fee for the CD or whatever it was that they got in the mail and everything just went downhill from there. But actually, it didn’t really because the web is great and I kind of moved that whole idea of creating that bulletin board system. I started building web sites and running a web site from my computer in the dorm room. Now we pay people like Bluehost and Amazon for hosting. Back then it was not so strange to actually run the hosting software server on your own computer and have your own IP address. But the web has expanded so much that stuff like that isn’t really practical. Anyway, we built websites. Then I started blogging or at least doing something that was kind of like blogging back in 1994 and 1995. Then around 1999 the blogger software came out and everybody became a blogger. Now there are all these websites and everybody’s creating their own communities and it’s great. So that was the early, early, history of me on the web. Tom: So let’s get into this personal finance idea. Were you the first blogger or at least as far as you know maybe? Harlan: Yeah, I think I was the first blogger to start a blog that was focused primarily on personal finance. Certainly, I wasn’t the first person to talk about money online. And I probably wasn’t the first person to blog about money. But as far as I know, I was the first person who created a blog specifically to talk about my financial problems, my journey, how to help myself improve and to just write about money every day. There was another early site called pfblog.com. I’m pretty sure we started around the same time but I think I was out there first. Although, if you looked at the site at the time—at pfblog.com, there were some earlier dated articles that I think he put up afterwards. Tom: I would also suggest that nobody visit that site because the last time I did it actually tripped my antivirus. It still exists but it might not be very well maintained right now. So you’ve also built up online communities. Not everyone will understand what it that is but the idea of blog carnivals or other ways of featuring other bloggers and helping people find this content has also led now to things like the Plutus Awards. Could you go into how some of those past sites and the Plutus Awards have helped people find this content? Harlan: Sure. When I started Consumerism Commentary which was the name of the site I started July 18, 2003, there were no other personal finance sites. But, I was getting a lot of my information, learning a lot and sharing it. A lot of the things I was learning were from sites like CNN Money which usually had some good information on it and the Motley Fool Discussion Boards which were always interesting. Those were some of the places I went to get information or to learn about money myself, and then write about things that I was learning. For some reason, other people also began writing about money in blog form. Over the course of the next few years there became more and more personal finance bloggers. As this group started growing, I would always find these sites and then reach out to people and say, “Hey, how are you doing?” and comment on their site if they allowed comments, because back then blogs didn’t have the commenting feature built-in. So we would find ways to communicate. I’d reach out to them, email them or whatever and let them know that I had a site too and that they should come check it out. As a result of communication like that, we kind of build closer relationships and began talking about blogging and the things we could do to get more readers to all of our sites which may not have been our initial intent. Very rarely at that point had I started a website thinking, “Okay, I’m going to start this website but how am I going to get readers?” It just wasn’t really all that interesting to me. It was more interesting for me to put something out into the world. If somebody finds it, they find it but I wasn’t too concerned with anything beyond that. Anyway, we started talking to all the bloggers. We all talked to each other. And it was kind of the birth of the community. More and more people started doing this so a few of us decided we wanted to help as many people as possible. One way we can do that is by solidifying this idea of a ‘network’ as part of the community, so we created the Money Blog Network which was me and five or six other bloggers at the time who were seen as some of the top bloggers in personal finance. We just started talking together and sharing ideas. By that point people accepted the whole idea of AdSense and advertising on blogs which wasn’t always something that was accepted among the general population. But it was more normal for blogs to accept money from advertisers so we would work with each other, share any leads we got or any other avenues for actually earning money from our websites. This, again, was something that was not really part of my plan when I launched. I knew that some blogs could make money but it just didn’t seem like something that was worth putting a lot of effort into at the time. Tom: Yeah, I didn’t really think it was money making venture when I started either. It was a chance to share my angle on personal finance. Harlan: Yeah, but if you put up some AdSense ads and make back the money that you’re spending on hosting then sure, it’s worthwhile. It turned out growing quite a bit after that. So the Money Blog Network was out there. And that was one way we could network with each other and create this feeling of a community and help people. There was a cool idea I came across. Someone else was taking the latest articles from all these blogs— and we’re talking about probably a couple hundred at this point, and just having a website where people could go and see all the latest posts from these couple of hundred blogs. And he was running ads on the website. Now, I’m all for putting ads on a website if it’s your own website and your own content. But here he was taking content (without permission) from a hundred or so bloggers, putting his own ads on it and making money off of someone else’s content. Yes, there’s the whole idea that he’s created this website and that should be worth something. That’s fine. So I just decided I wasn’t going to complain about this. Instead, what I’ll do is I’ll take 24 hours; write my own program that will do exactly what he wrote his software program to do. I used resources like different programming packages that would help with this. Anyway, I built a website that did exactly the same thing; no ads. I made it more community-focused; working with the community rather than just taking things without permission and then built that website called, pfblogs.org. That was one of my early community efforts. Another one is the Carnival of Personal Finance. That was a weekly roundup of the best personal finance articles. This is all going to sound familiar because it’s been done in a lot of different ways on a lot of different sites. In fact, we’re getting to the point we’re at the Plutus Awards, we’re doing this exact same thing and keeping it on our website. Anyway, the Carnival of Personal Finance ended up being more than just picking five articles a week. It was a lengthy process. Sometimes there were 50 or 60 links included. This ended up being a bad idea SEO-wise. At first it was great community-building because it was hosted by someone else in the community every week. That week they would go through the process of weeding through articles and picking out 20, 30, 40 of their favorites and putting them on a website. I’d gotten the idea from a similar thing in a different niche. Somehow I came across the Carnival of Education. It was basically the same idea. And I thought it was a cool idea. There was a community of bloggers who were all involved in education. Given I’m a part of a community that has bloggers focused on personal finance, we should do this too. And so I brought the idea over to the community and we probably did something like four or five years of The Chronicle of Personal Finance before I let it go to someone else within the community after I sold my website. It just really wasn’t the best way to moderate content. It was fine for the time and then other things kind of supplanted it, I guess you could say. Tom: And nowadays with social media and things like Twitter and stuff that didn’t exist at the time—that’s sort of an easy way someone can find this content. Let’s wait on the Plutus Awards because that’s still an active thing. We’ll put that at the end. I wanted to ask you what you thought about what attracts people to blogs compared to (here in Canada) the Globe and Mail. What about that personal experience makes people get hooked on these blogs? Harlan: Two things that I can think of. First of all, there’s the personal voice. When you’re reading something in The Globe and Mail, CNN or The New York Times… The New York Times doesn’t even have their money section anymore as far as I know. That type of content is fantastic for informational stuff, for things that you need to know and great advice for managing your money. You can say the same thing about blogs but the difference is the voice. It’s more personal. It’ll include personal stories. I used Consumerism Commentary to track my progress over time. A lot of people use their blogs to do the same thing. That, for me, is so much more interesting and personal. And you can make those personal connections with the person who is writing. Or in the case of a podcast, the person who’s speaking. That’s one of the crucial pieces that attract people and why people should be attracted to this type of writing. The second thing is the editorial process. You are just a lot freer to be yourself, to let your personality shine through and, from a reader’s perspective that comes through. There’s immediacy to it. Of course, a lot of the new sites now are a lot more immediate than they used to be. It used to be you wouldn’t see an article published online until it was in the newspaper the same day which meant that they couldn’t react to things happening the day of, as readily as they do now. But even as the mainstream media, big media websites have gotten a lot more nimble, they still can’t beat the immediacy of blogs. You just sit down—and you don’t even sit down at a computer anymore, you just type up your blog post on your phone. It’s so easy and quick. It’s not a perfect system. There’s a purpose to having an editorial process in place. It makes sure that you’ve checked your facts or that somebody has checked your facts and you get another pair of eyes on it. You get formatting. There are so many things that go into the editorial process that are important. But at the same time, with a personal financial blog there’s just so much you can react to quickly and not have to worry so much about the editorial process. Of course, you still want to get all your facts right, and you want to know as a reader that what you’re reading has been verified and fact-checked and it’s someone you can trust. But just the immediacy of blogs is something that’s really attractive. Tom: Yeah. One of the things that can be a negative of blogs is knowing which sites you can trust. Granted, you can say the same about mainstream media as well. But with blogs, a lot of people if they’re not used to this kind of format, there’s a little bit more concern about things like how the blogger is making money or do they even know what they’re talking about if they’re speaking from authority and not from their own personal experience. Can you tell us how we can look at this with a critical eye to make sure what we’re reading is factual and meaningful? Harlan: I think this gets to the root of a concept called media literacy. We talk about financial literacy a lot because we are financial bloggers and know that it’s important for kids to learn about managing their money at an early age so they can survive as an adult. But one thing that we don’t talk about too much but is starting to have more of a role in schools is this concept of media literacy. How do you know whether what you’re watching on TV, what you’re reading—how do you critically evaluate the information that’s coming to you? I believe media literacy is a bigger problem in the modern world even than financial literacy. I don’t know exactly where to begin with teaching somebody how to comprehend and understand the motivation behind any piece of information that you’re receiving. It also goes to explain why, as a society, we’re so susceptible to things like propaganda, advertising and any type of information that is designed to sway somebody. It plays on people’s emotions. It is just so attractive. People will be susceptible to messages that they’re receiving without having a critical approach. It’s important to maintain a critical eye and be fully understanding of more than just the content that’s in your face when you’re looking at blogs, whether you’re watching a TV show or reading the news or an opinion piece. I think it comes down to understanding what the motivation is behind the piece of content you’re consuming. Is it trying to get me to have an opinion? Is it trying to get me to make a decision? Is it trying to get me to spend money? Is it using me as a way to earn money for just being a reader of this because now I’m being counted as part of the audience? What is the motivation there? A lot of that can be hard to figure out. We tend to rely on things like FTC disclosures to tell us what we’re about to read is informational and my opinion but also I may be paid if you end up buying something off this website. We can look for things like that but that’s not always going to be clear. I think it’s really important as consumers of content, of media, to have a good understanding of what someone’s motivation is when they’re putting together a piece of content or media that you’re consuming. That is so hard to do because a lot of that can be easily hidden. You’ve got to really consider the source and learn about it before you go ahead and make any decisions on it that might affect your life in a way that you don’t want it to be affected. Tom: For sure. Here in Canada we don’t have the FTC disclosures but I’m a huge fan of them. It’s just good to put that out there and to explain that this is how the site makes money. The fact that it doesn’t change our opinion in the post. Harlan: And the question is, does the FTC disclosure work? First of all, does the fact that I’m getting paid by Chase, for example, for someone who comes to my website and sees a review of a Chase credit card and decide to click on over to Chase and sign up for the credit card based on the positive review I gave on the website. How do I know that my opinion hasn’t been affected by not even the fact that there is a financial transaction, but the potential of there being a financial transaction? People might not even have affiliate relationships or might not be getting paid from credit cards but they’re thinking that some day they might want to be a person who gets paid for writing their reviews of credit cards. So, they want to be honest. I struggled with this too. I made it clear every time I wrote about credit cards—as clear as I could, that there are certain people that I would recommend credit cards for and there are certain people that I would not recommend credit cards for. And I tried to make that distinction. Regardless of that, how much of what I wrote was still affected by the fact that I was either getting paid or could have been getting paid for a successful lead generation. I think it’s something that you have to consider even when there’s no clear relationship with an advertiser. Tom: Yeah, I’ve been questioned on this too. And it’s good because people should be looking at this critically but I wish I could be as up front as showing what I get paid because in no way am I ordering things based on who pays the highest or if I get paid at all. About half the credit cards on my site there’s no relationship with. But it’s hard to fully get that across in a blog post. People email me and ask though. And it’s a fair question; is your number one card just what pays the highest? In the top two categories I write about, the number one card is literally what’s in my wallet which makes me feel okay with that and justified. I can actually recommend the cards I use so it’s totally a fair question. Harlan: Yeah. And it’s only one of the questions. Just because someone is getting paid doesn’t mean that the information is not accurate or not useful or is biased in some way. It’s looking at the bigger picture and figuring out what information you can trust and if there’s anything in there that you can’t trust. Tom: For sure. Can we move on to the Plutus Awards now? Tom: I want to point out one of my favorite things about this. I don’t want to steal your thunder by talking about it but my favorite thing is the fact that it is “peer” reviewed. The people that are winning and even nominated (I believe) pass through this panel of peers. Those that go on to be nominated or win, there is a process there where if someone’s reviewing the Plutus Award site they can trust in those sites a little bit more than something that’s totally unknown. In your own words, can you tell us how people can use the Plutus Awards, the whole process, the site and everything? Just as a regular reader that’s sort of looking for new blogs? Harlan: This is a perfect segway, I think, because we’re talking about how you trust the things you read. Because of the peer review process for the Plutus Awards, I feel if you take a look at the finalists and you take a look at the winners you can find a selection of the absolute best and some of the most trustworthy places to find financial type of content. Whether its blogs, podcasts, videos or whatever it is, we’ve got it at the Plutus Awards. Everything has been put through a process to determine which ones really are the best. Of course, it changes every year but the process doesn’t change every year. The process is very similar. This is what we’ve had in place for a long time. We have a group of anywhere between 30 and 60 volunteers who review submissions and entries from all across the web for the best financial content out there. It’s broken into groups and reviewed. It would be kind of crazy if we had each person on the panel reviewing tens of dozens of submissions in 30 categories. That would just be way too unmanageable for everybody. So we have it split up so everybody has a reasonable amount of consideration to do. There’s a voting process that takes place within the panels. It’s kind of like the Academy of Motion Pictures where there is a smaller group of people that is representative of the wider community. Although, we try to be a little more representative of the wider community than say the Academy of Motion Pictures. But we do try to take diversity of content and a whole bunch of different aspects of the community into account when we do this. We have this group of people who vote on the submissions. We end up with a group of finalists and then there’s a final vote to determine the winners in each category. So it’s a great way to find the right blog that matches the content you’re looking for or the personality you’re looking for. By looking through the Plutus Awards and the selection of winners and finalists you are guaranteed to find something that speaks to you and presents great information the way you want to consume it and is entertaining at the level that you want it to be; is informational at the level that you want it to be, and is all around just a great community of their own to be a part of. Tom: It’s been great. I think people be very inspired to go find some more blogs. I’m glad they’re listening to Maple Money Show but there are other things out there so I’m happy for them to go check out the Plutus Awards site and find some other sites. Can you let everyone know what else you’ve been up to, especially with the Plutus Foundation? Harlan: This is our 10th year with a Plutus Awards so this is a big year for us. We’re really excited about celebrating that. But a few years ago me and a few others built the Plutus Foundation to be around the Plutus Awards and it’s a financial literacy, non-profit, but the focus for us is on the financial media—this community we’ve been talking about since but we started at the beginning of the call when we talked about the 2003 Consumers Commentary. This whole financial blogging, podcasting, video community. We want to support them as they go out and create their own personal financial literacy projects in their communities or online. Or if they have efforts we will support them with different types of resources whether it is money, content or social media help. Whatever it is we can provide to help them that is what we do. One of our own programs which we just launched in November last year with a preview and then the first one this year is Plutus Voices which is sort of like a networking event where there’s also a couple of speakers who talk for a short time but they talk on really important topics. There’s an interesting element to these events that gets everybody involved. We don’t like to really talk about it too much until people get there so they can kind of react to it without any kind of preconceived notions. But it’s a really fun activity. We are bringing that to Phoenix and L.A. in the spring. And in the fall we’ll be at some other locations throughout the country. Tom: Sounds great. Thanks for being on the show. Harlan: Thanks for having me. Thanks Harlan, for the advice on how to dive into the online pool of personal finance blogs. You can find the show notes for this episode at maplemoney.com/harlanlandes. If you subscribed to the Maple Money newsletter recently you may have noticed that the links to all the downloadables were broken. Sorry for the issues but they’re now not only fixed, I used this opportunity to update the look to match the Maple Money site. I’ll leave a link to the download section in the next few emails that go out so you can hop back there and get your budget files and checklists. And if you haven’t subscribed to the newsletter, head over to maplemoney.com/newsletter (now with working links) and we’ll see you next week.